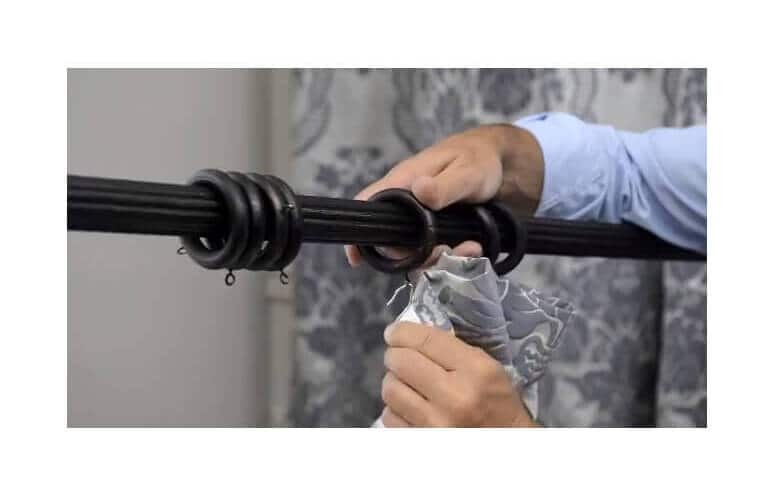 How to hang your new window treatments like a pro! 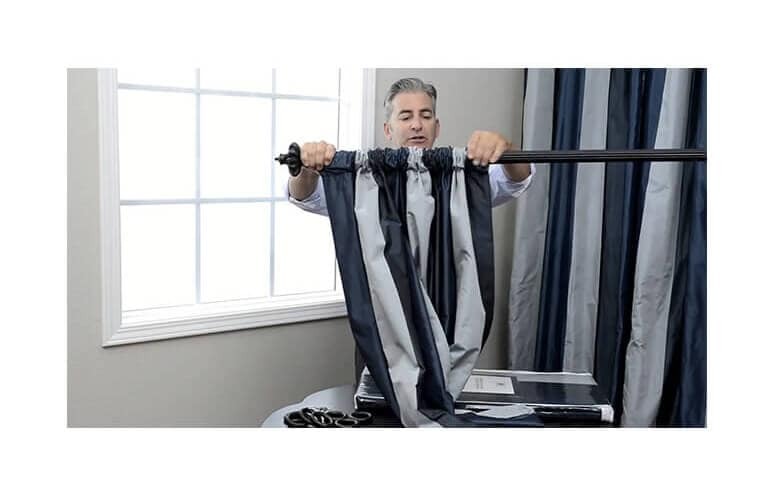 Many fold lines and wrinkles will release and fall out after your drapes are hung. 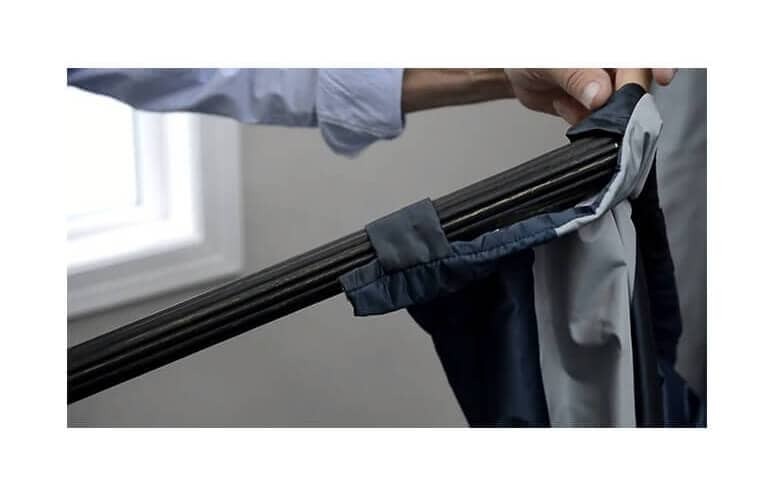 Stubborn fold lines and wrinkles can be steamed out using an iron or garment steamer. Hold the iron or steamer at the back of the panel and steam through the lining. Avoid making contact with the face fabric. Prior to hanging, you can remove wrinkles using the coolest iron setting possible. Always iron your panels from the back of the panel, through the lining, never making contact with the face fabric. *Velvets and silks should be steamed after they are hung, from the back, through the lining. Please note: fabrics like silk and linen contain small wrinkles that cannot be ironed out. Pole Pocket panels make a casually elegant statement in a room. Easily installed they require a minimum investment in hardware. 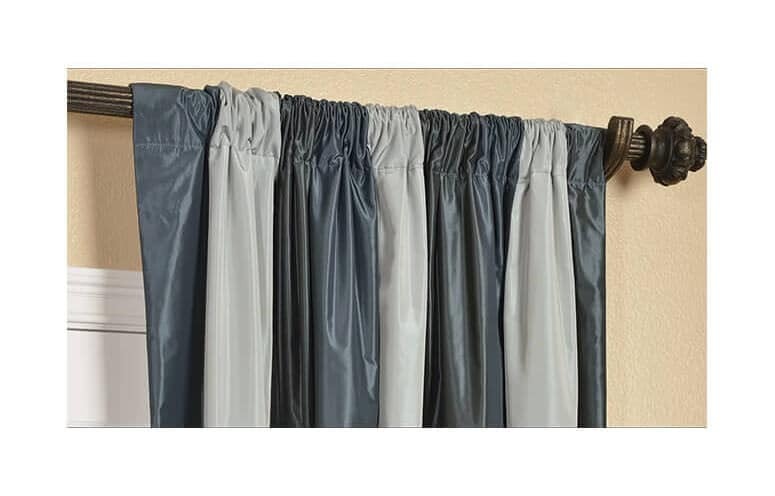 Most of our Pole Pocket panels can be sheered on a rod or hug from rings. Panels that are sheered on a rod are not easily drawn opened and closed and are not recommended for functional treatments. Insert the rod though the pocket at the top of the panel. Arrange gathers evenly on the rod and then arrange folds. Repeat steps for all other panels and place rod on the brackets. Insert the rod through the back tab at the top of the panel. 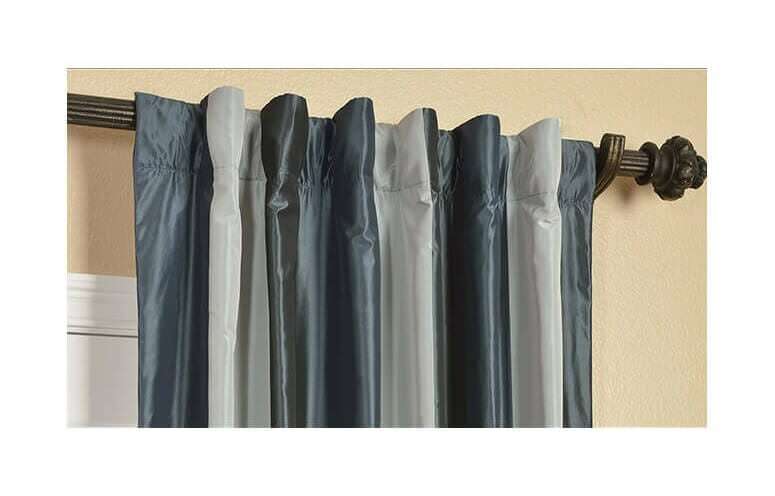 Continue to insert rod into each curtain back tab. Repeat the steps for all other panels and place rod on brackets. Insert the pin as far as possible without going through the face fabric. Try to set them so the top of the pin sits ½ to 1 inch below the top of the panel. 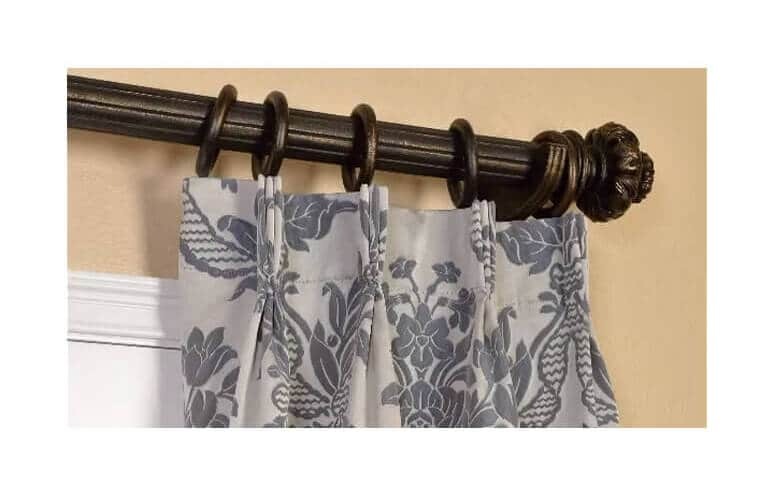 Set each drapery pin 8 inches apart across the back of the pole pocket. 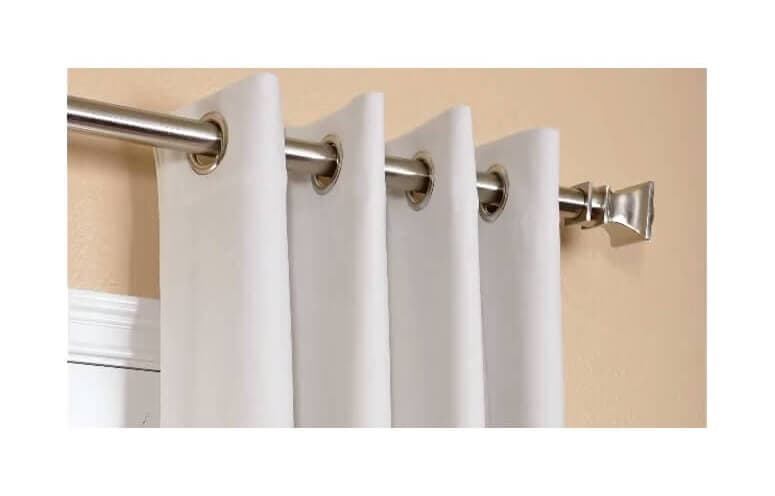 Pull the fabric between the rings forward on each panel and place rod on brackets. 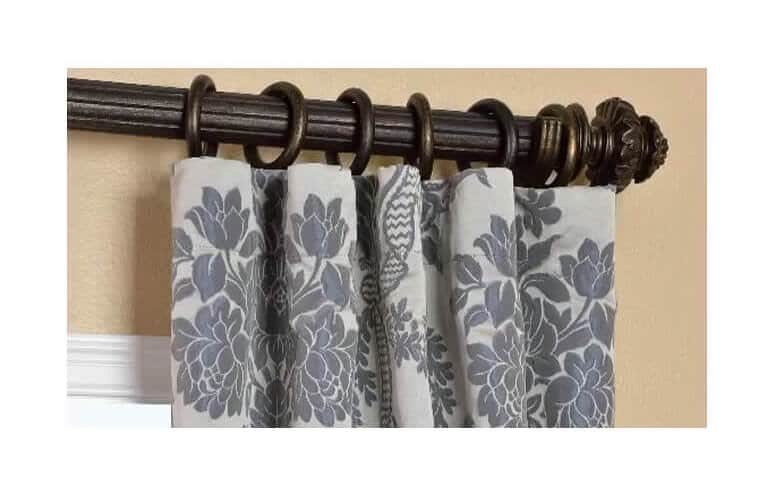 Select a metal rod that matches the grommet on curtain. Starting from the front side of the panel, thread the rod into the first hole on either end of the panel. Continue weaving the rest of the grommets on to the rod. Repeat steps for all other panels and place rod on brackets. Pleated drapes are the most practical solution for a functional treatment that must be pulled open and closed every day. The good news is that they are classically beautiful and timeless. Insert the pins in the back of each pleat at the seam without going through the face fabric. Try to set them so the top of the pin sits ½ to 1 inch below the top of the panel. Feed the appropriate # of rings, or carriers onto your rod and hook the drapery pin through the eyelets at the bottom of each ring or carrier. (Pinch drapery pins closed for heavier treatments). If a return is desired set a drapery hook at the very end of the panel. Hook the drapery pin through the hole in the bracket, which is closest to the wall. If no hole is provide, you can install a small eye hook or screw into your wall, next to the bracket. 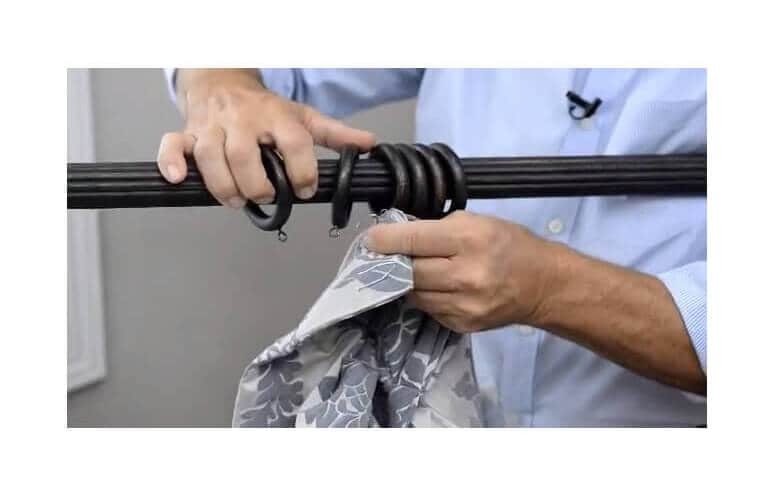 To “train” pole pocket drapes to keep the proper folds, gently push the folds together from top to bottom. 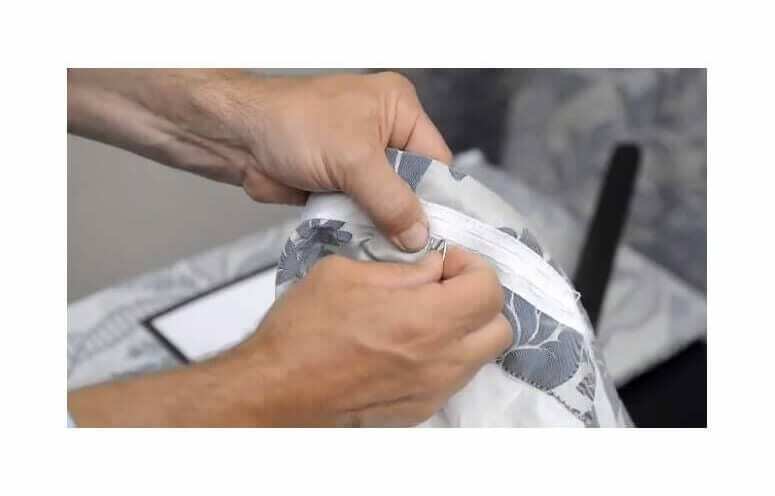 With a strip of fabric, (not string or twine) keep the folds together by wrapping them in place in several places from top to bottom. Keep the folds wrapped for several days, if possible. You may even want to set the folds by steaming them with a garment steamer or iron. 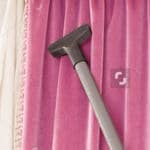 To train pleated drapes you can do something called “breaking” the buckram in between the pleats. Buckram is the stiff stripe of interfacing sewn along the top of a pleated panel to give it body and stiffness. Simply pinch or bend the buckram halfway between each pleat. This will create a “memory” of the fold so that the panels will fold properly each time it is opened and close. The marriage of form and function never looked so good. Whether you need to create privacy, block light, or just add that finishing touch to your room, our Roman shades are the answer. Offering handwoven cottons, luxurious silks, lush velvets, printed cotton twills and gorgeous faux silks, we are here to help you create a look that is all your own. Custom made to your exact specifications with numerous lining options, your custom Roman shades are just a click away. Position the shade as you want it to hang in the window, with the front of the shade facing into the room. Center the shade inside the window frame at the required depth. Place the shade in the position you selected. Align the shade and make sure the draw cords are free. Install the shade using the screws provided by drilling straight through the headrail and into the window frame. Position the shade as you want it to hang on the molding or wall above the window opening. Make sure it is centered. 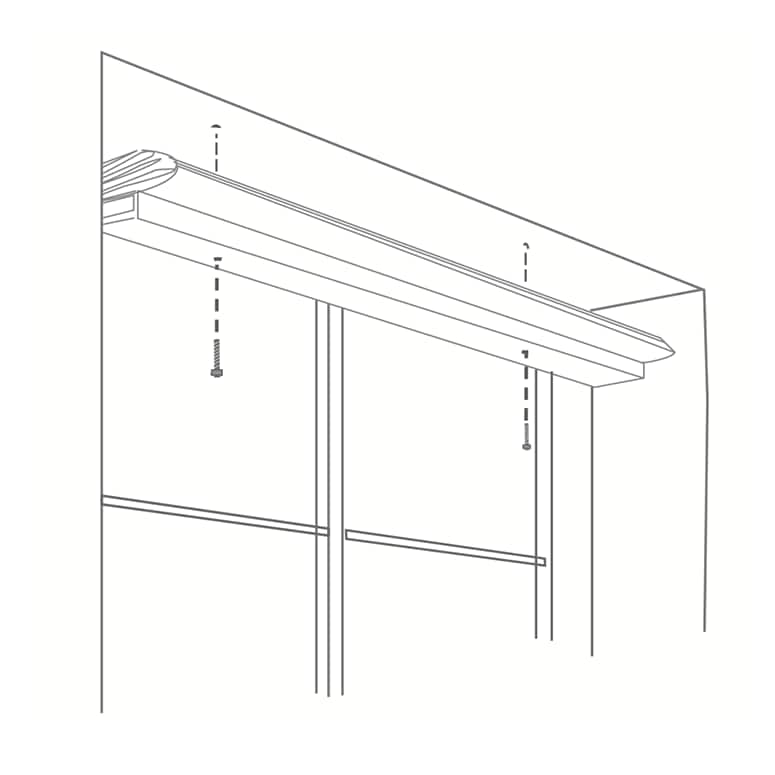 On the wall or molding, mark the positions where you will install the L-brackets, 2" in from each side of the shade. For wider shades, position the third L-bracket at or near the center of the shade, making sure it does not interfere with a screw eye on the shade. Mark the position. Make sure all L-brackets are level and aligned. Remove the shade. 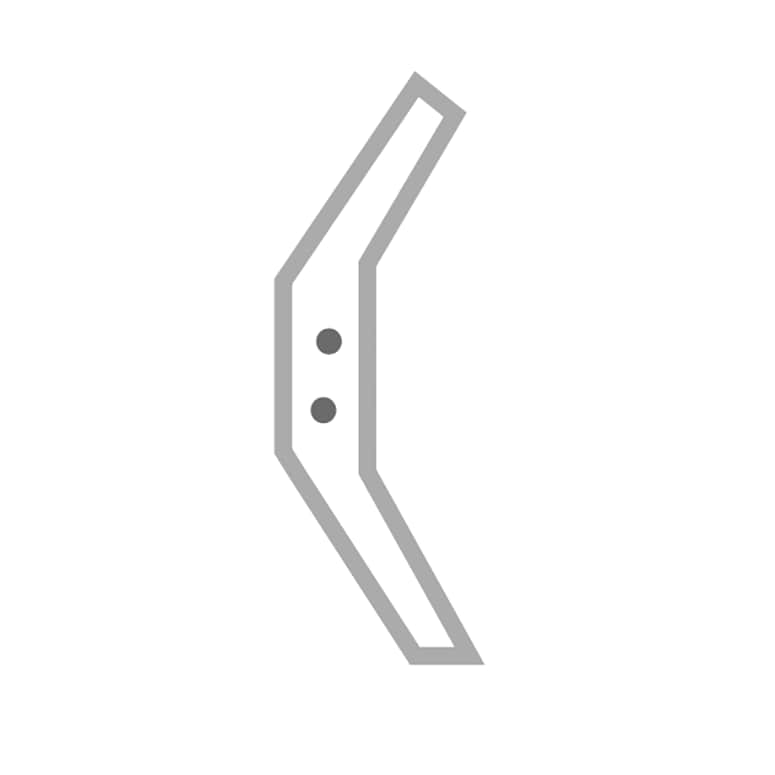 Attach the L-brackets to the wall or molding, using the screws provided. 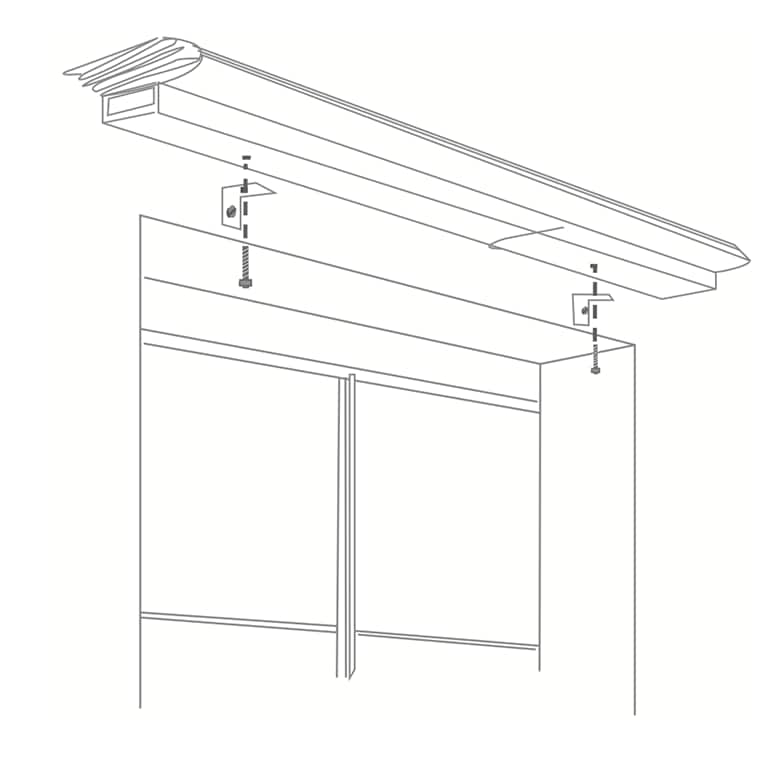 Ensure that the L-brackets are level and evenly spaced before installing the shade. Place the shade on the L-brackets and push it back against the wall or window frame. Center it, and make sure the drawcord is not snagged and is freely available. 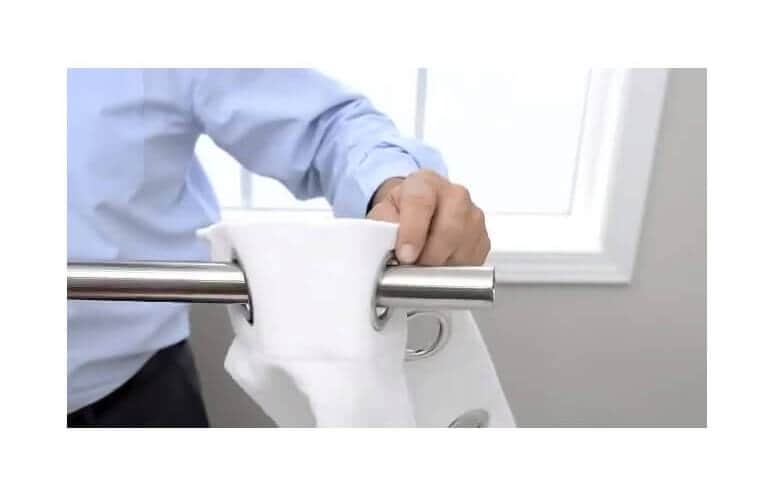 Attach the headrail to the L-brackets using the screws provided, being careful not to drill through the fabric at the top of the headrail. To protect small children, you should install the cord cleat to keep the control cord out of harm’s way. Simply mount the cord cleat to the wall or window frame next to the shade with the screws provided. mount the cord cleat at a safe height, taking into account furniture or other objects upon which a child may climb. Then, after each use of the shade, simply wrap the excess cord around the cleat. it's fast, easy and safe. we only use top-quality fabrics. 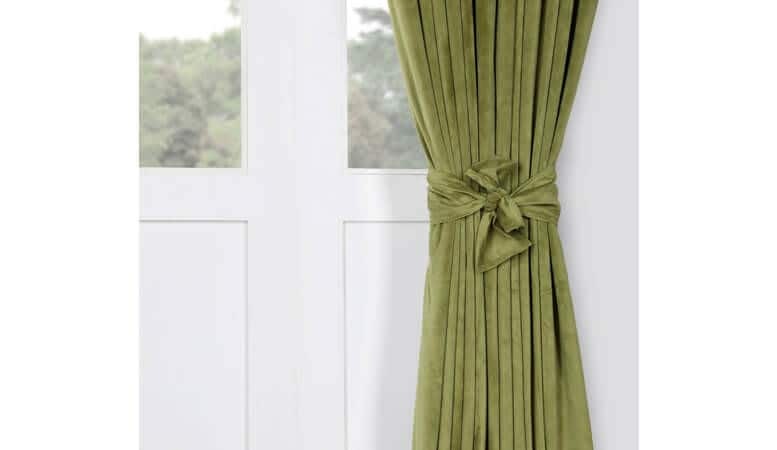 Use these tips to preserve the beauty of your window treatments. 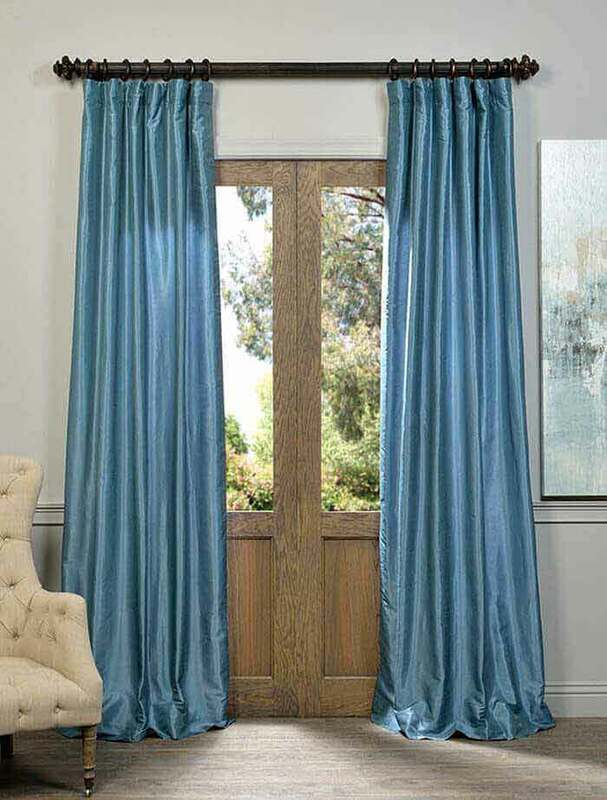 Just as with any fabric, window treatments can become dusty if not cleaned regularly. Use a vacuum with an upholstery tool for best results. For stubborn stains or overall deep cleaning, professional on-site service is recommended. Professional on-site cleaning can bring new life to older or stained window treatments. 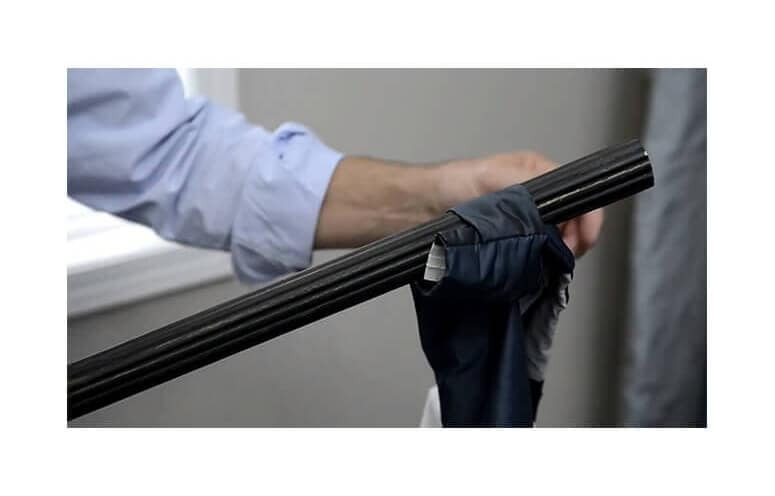 Dust your hardware regularly with a soft, dry, untreated cloth. If your hardware is wood, be mindful that heat and moisture can damage any wood finish. 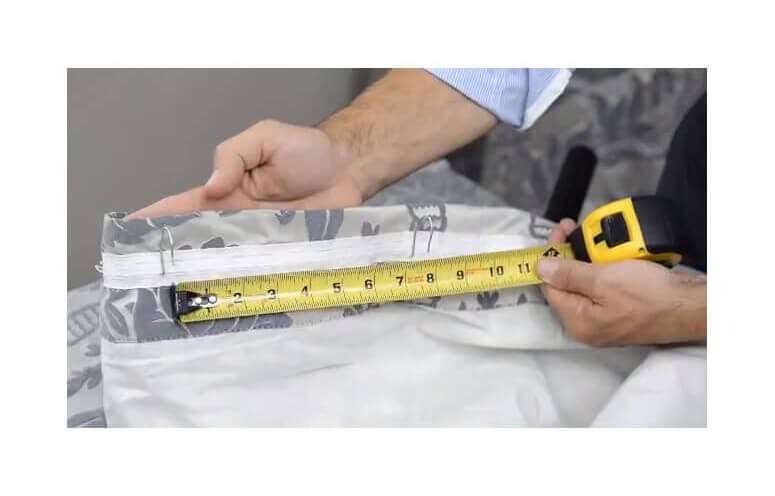 Discover the way to measure for your window treatment with our measurement guide. Decorating tips and philosophies straight from the source: interior designers. 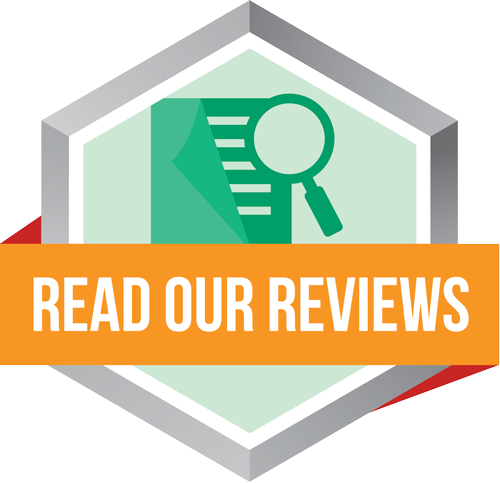 We proudly guarantee our workmanship on our shades, curtains, and hardware.